What is it? 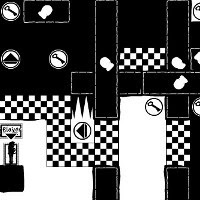 – Shift 4 is the latest entry in the excellent monochromatic platform-puzzler series. Your spaceship crashes on a strange planet after being attacked by a giant “space squid,” and you’ll use your ability to shift between light and shadow to navigate a mysterious facility. Who made it? – The game was developed by Tony Lavelle of Armor Games. How does it play? – Platforming is king. Each level is a self-contained puzzle (or set of puzzles), but the levels are tied together via a series of numbered doors. You’ll need to pay special attention to the map at the bottom of the playing area, so that you know where you need to go. Shifting between light and dark will change how you interact with each level. Shift 4 introduces some new mechanics that make it the most challenging game in the series. You’ll eventually gain control of multiple characters which you can easily switch between. Keys will cause platforms to rotate, and other pickups will spin the entire level or change the composition of certain platforms. Presentation – True to the other games in the series, the graphics are black and white, and your character reacts to the environment based on his current state. The concept is recognizable in some well known optical illusions (i.e., the “1 cup or 2 faces” picture), and makes for some very interesting gameplay scenarios. Positives – The puzzle-based level design is great, and the inclusion of a more fleshed-out story (however bizarre) is also a welcome addition to the series. If you’re a fan of the previous Shift games, you won’t be disappointed, and may even be pleasantly surprised. The inclusion of a level-editor is a great bonus. Negatives – The black-and-white graphical style, while integral to gameplay and very well implemented, might cause you to go cross-eyed after playing for a while. If you haven’t played Part 1, Part 2, or Part 3 series, doing so is highly recommended (but not required). Why you should play it – Shift 4 provides some truly mind-bending puzzle-solving and platforming action that’s a lot of fun. It’s my favorite in the series so far, and is well worth a look.